Tired of neck cramps? How about a neck clamp instead! 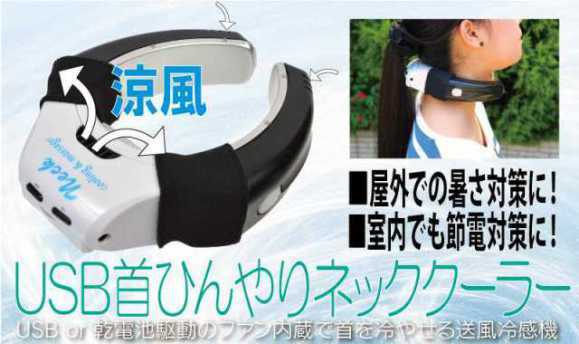 Thanko's new USB Neck Cooler makes you look like a sci-fi mecha robot's grabbed you by the throat but at least you'll feel a lot less hot under the collar this summer if you're wearing one. 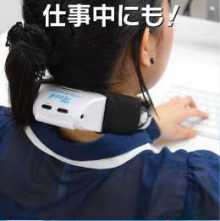 Looks aside, the 195gm (about 6.89oz or under half a pound) USB Neck Cooler was designed to chill those sweating out yet another horribly humid Japanese summer. Powered via a USB connection or from two AAA batteries (which will add to the weight), the cooling clamp is ideal for anyone stuck indoors at an office desk or outside gardening, jogging or playing sports... and you thought people wearing Bluetooth earpieces looked weird! Thanko's obviously put a lot of thought into the USB Neck Cooler, not to mention engineering that seems plausible at least. The two arms of the device are faced in heat-conductive metal; an internal fan at the back draws fresh air through forward vents and as the air passes through the hollow arms it draws heat from the wearer's skin. As long as the outside temperature remains below body temperature (98.6 degrees F), the heat differential works to the wearer's advantage. One would imagine wearing it in the sauna is a big no-no. Thanko is offering the USB Neck Cooler for the low, low price of 1,980 yen (around $19.80) including tax and a three-month manufacturer's warranty. If you purchase one today, you just might not have a red neck!